Toronto: McClelland & Stewart, c1974. I put off reading this book for years, thinking it was going to be a dull, good-for-you classic. I'm not sure why, as I absolutely loved Laurence's novel The Stone Angel when I read it years ago. In any case, I couldn't have been more wrong about this one. This a story that feels fresh and modern in the way that it plays with structure and form. It asks questions concerning a woman's independence and her role as wife, mother, person. I found Laurence's method of telling the story through sections separated out as memories, inside memories, writings and so forth really fascinating. The story shifts in time like a person talking, retelling their life in back and forth fragments. Yet it's completely coherent and builds narrative tension. Morag Gunn is from the small town of Manawaka; orphaned at age four, she is raised by the town refuse collector and his wife. Her main goal is to get out of town as soon as possible. She succeeds in leaving to go to university, and through a circuitous route, including a relatively brief marriage, ends up with one daughter and a house in the Ontario countryside, from whence she tells her story. And she tells it, full of sensory details and clever writing, as suits the writer Morag has become. She compares moments from all over her life and reflects on her prickly nature, including being totally honest about what she's done right and wrong over the years. She's a strong, complex, completely real character with a thoroughly active internal life. This is a Canadian classic that has the whiff of the 70s about it, in its focus on a woman's life and her struggle for individuation, and in the elements of identity, both personal and national, that arise again and again. But it's also modern and relevant and just really, really interesting to read now. It's the horrific covers! I loved the Stone Angel, and the Fire-Dwellers was also very readable but it never feels like it will be a good book when I start, based on my own stereotypes. 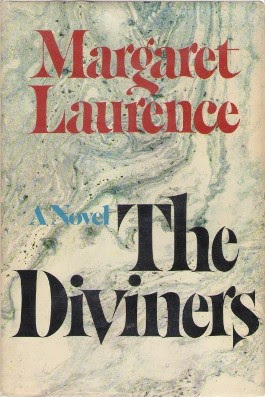 I can't wait to read The Diviners. Ha, you are right, some of those old covers are... uninspiring to say the least! I'd like to read all the Manawaka books now. She is such a fabulous writer. I'm glad that this felt fresh and modern to you. Excellent, concise review. She's one of the big names in CanLit so I was very pleased to find that her work really holds up and still reads like it's brand new and exciting. I really enjoyed it.